Gynecomastia is a glandular development of breasts in males. It is quite common although not often discussed openly due to a certain stigma men feel about requiring breast surgery. Sometimes the cause is a result of hormone changes during puberty but increasingly in males between 16 and 50 years, it is a result of using steroids or steroid like substances. Male Breast Reduction is a procedure to produce a flatter, firmer, and better-contoured chest by removing fat and glandular tissue. Men who suffer from Gynecomastia usually feel self-conscious about the appearance of their chest, with surgery necessary to regain self-esteem. Note: Twilight Sedation is not used. Traditional Liposuction – a special solution of weak anaesthetic is introduced into the fat pockets, then small hollow tubes (Cannula) about 3 – 4 mm in diameter are used to extract out the excess fat cells. Vaser Liposuction – an Ultrasound technology that liquefies the fat and allows for greater precision and noticeably superior results. This technique is designed to virtually eliminate bleeding during surgery and to reduce inflammation and bruising. Incisions are closed and dressed and a special garment is used to apply pressure. Learn more about Liposuction. Excision – excision techniques are recommended where glandular breast tissue or excess skin must be removed. Incision patterns vary depending on the specific conditions and surgical preference. Some incisions may be visible or concealed within natural contours. * Note: All procedures in Thailand, are based on standard, non-complicated procedure patients. Will there be much scarring after the procedure? Your Plastic and Reconstructive Surgeon will ensure that there is minimal scarring from your breast reduction. Incisions are positioned to be least noticeable, if not hidden, along the lower border of the areola, where the pigmented and paler skin comes together. Within 6 – 12 months after surgery most scars will usually fade from the surrounding skin. 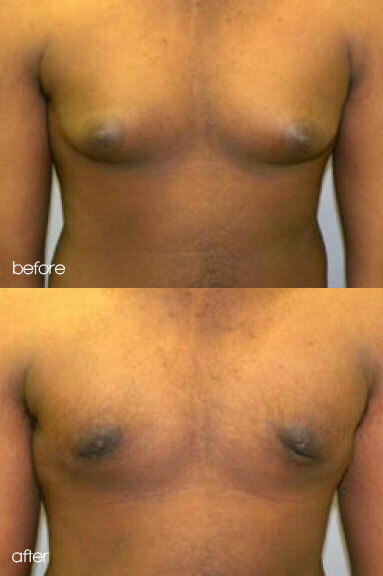 Is there much pain after having a Male Breast Reduction? Generally there is mild to moderate pain after a Male Breast Reduction. Pain relief medication prescribed post-surgery by your Surgeon can assist with managing this if required. What happens during recovery after Male Breast Reduction surgery? Surgical drains are left in place for a few days to empty fluid after surgery if a substantial amount of tissue has been removed and if the skin is loose. To assist healing and help reduce scarring, a surgical vest needs to be worn under your clothing for a few days. It is then replaced with less bulky dressings and a compression vest is worn for a few more weeks, during which time you are unable to exercise the upper part of your body. The stitches around the areola are dissolvable and do not need to be removed. Most patients take 3 – 4 days away from work, but some return even sooner. Could suspected Gynaecomastia be Breast Cancer? This is uncommon and male breast cancer is rare but if you find a firm, painless lump in your breast (generally on one side) you should seek medical advice.